The last wild Franciscan manzanita. The Franciscan manzanita is native to San Francisco. It was once found at the former Laurel Hill Cemetery, the former Masonic Cemetery (near Lone Mountain), and Mount Davidson. It is not known to have occurred anywhere else on Earth. The Franciscan manzanita’s tragic history is filled with heroic acts by botanists striving to keep the species alive. In 1906, the specimens first used to identify the species were rescued from the California Academy of Sciences as fires driven by the San Francisco earthquake ravaged the Academy’s collections. In 1947 a famous botanist stood in front of earth-moving equipment to wrest the last known wild plants from a construction site. These plants were sent to a botanical garden, and for the next 60 years no one saw the plant in the wild. But then in 2009 a botanist driving newly-cleared areas in the Doyle Drive construction project made an unusual observation: he saw a manzanita on the side of the road, in the middle of an area where construction was about to begin. 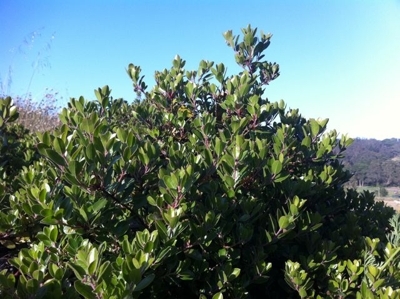 He relayed his findings to National Park Service and Presidio Trust staff, who then raced to the scene and discovered that the plant was a Franciscan manzanita: the first to be seen in the wild since 1947. A collaborative effort was then launched to move the plant to a more secure area in the Presidio. But because the plant was considered extinct in the wild, it was never granted full Endangered Species Act status, and the individual plant, which comprises the entire known wild population of the species, could be harmed without consequence under federal endangered species laws. The Endangered Species Act, the world’s most comprehensive and effective law promoting the protection and recovery of threatened wildlife and plants, must now—finally—be invoked to protect the San Francisco manzanita. Once protected, the plant will have its critical habitat areas protected from development; a comprehensive recovery plan for the species will be created and funded; and it will be illegal for anyone to cause harm to individual plants.